Hi! Welcome to my plugin demo! 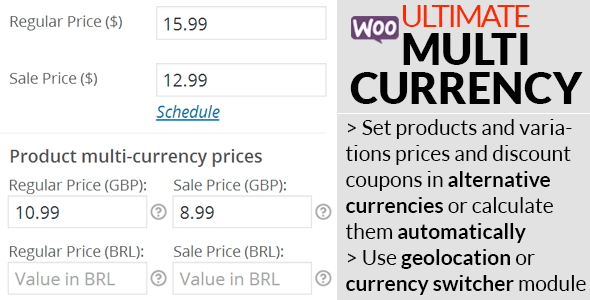 WooCommerce Ultimate Multi Currency Suite is an advanced multi currency plugin for WooCommerce. I strongly believe this is the best multi currency plugin available on the market. To read more about it, please go to plugin CodeCanyon page. After user switches his currency (or his currency is set automatically using geolocation), it will also be used for payment. This plugin also allows you to use the alternative currency just for user reference (user sees alternative prices in other currencies, but payment is executed in shop’s base currency). This store uses GBP as a base currency. After user switches his currency to, for example, USD, all prices will be either a custom USD prices set for each product or automatically calculated prices if no specific custom prices has been set. Alternative currency (USD in this particular case) will also be used for payment (in PayPal or any other gateway). WooCommerce Ultimate Multi Currency Suite is available on CodeCanyon. You can buy it here – WooCommerce Multi Currency.